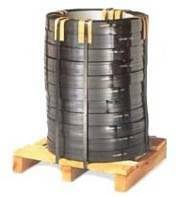 Polyester Strapping – quickly becoming the standard replacement for steel strapping. Its unique qualities make it ideal for securing any palletized load at substantial savings. Polyester provides excellent retained tension to stay tight on rigid loads and its superior recovery properties help to absorb impact without strap breakage. Polyester also performs well in a wide range on environments. It is resistant to sunlight and performs well in hot and cold climates. It will not rust eliminating concerns of staining. Embossed polyester provides superior performance in many machine brands. The embossing enhances the performance of the strap by increasing the resistance to split. It also provides greater flexibility to better conform to your package. 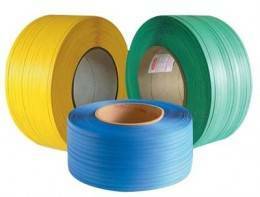 Polypropylene Strapping – a great choice for bundling or unitizing loads. The material is more portable than steel banding and much less likely to cause injury during application or removal. It is available in a variety of sizes, colors, and breaking strengths to suit your needs. 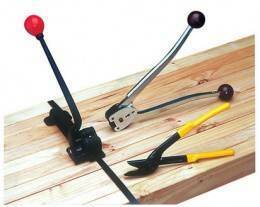 Steel Strapping – comes in regular duty, hi-strength and hi-tensile. 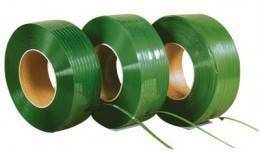 Regular duty is a low carbon strapping produced for light to medium duty applications. Hi-Strength uses a medium carbon to produce stronger tensile strengths. The thin gauges (.016-.018) offer regular duty characteristics using a lighter gauge. This provides additional footage per coil and fewer coil changes. Hi-Strength is also an alternative to high tensile. The standard gauges (.020-.025) offer equal tensile strength allowing for substitution of high tensile where shock resistance is less of an issue. Hi-Tensile is a high carbon strap treated with heat to provide superior elongation and tensile strength.